Mack Trident 6x4 Axle Back truck. The MP8-powered Trident seems to have become the highway face of Mack lately, with an increasing presence on the road, finding favour on the East Coast with the likes of Lindsay Brothers, Damorange, and Don Watson Refrigerated Transport, among others. In fact, they have become so popular I found it hard to get my hands on one, so I had to pinch someone else’s instead. Tony Watts is the full-time driver of the Trident at the moment, although the Trident is a stand-in unit until the 685hp (511kW) MP10-powered Superliner that Tony’s boss has ordered arrives. 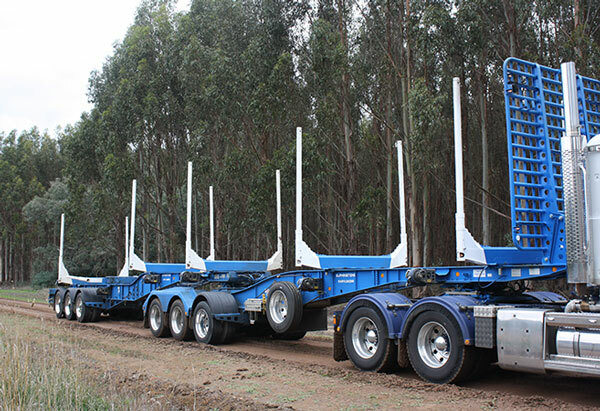 As you may have gathered, given there’s an MP10 on order, Tony’s boss, Orbost-based logging transport company owner Richard Pelz, is somewhat of a horsepower nut. The company already boasts a Volvo FH700 and a Cat-powered Peterbilt 379 among the mainly North American fleet of 12 trucks, so the incoming big banger will be in good company. 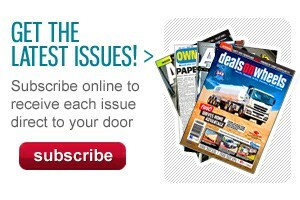 A good deal of the company’s work comes out of Gippsland’s forests in eastern Victoria, but Tony’s run takes him from Heyfield all the way across to the eucalyptus plantations of Victoria’s Western District and back to the Australian Paper Mills (APM) plant back in the Latrobe valley town of Morwell. I caught up with Tony and the Trident on Melbourne’s western outskirts, where I climbed into the recently vacated driver’s seat. As far as the rest of the Mack range was concerned I’d started at the top, having spent time in both the Superliner and the Titan, both powered by the brawny 685hp MP10 engine, this was going to be my first association with both the Trident and the MP8 engine. The performance of the 13-litre MP8 was deceptive, if you could forget the numbers stamped on the side of the bonnet, you could be forgiven for thinking that there might be a couple more litres of displacement lurking inside the engine block. Peak torque is available from 1,100rpm right through to 1,500rpm, but the engine seemed to be right on song around 1,600rpm. The engine showed characteristics very much like a couple of its American competitors in terms of its driveability, rather than the lower and slower revving feel of its 13-litre Volvo stablemate. The real star of the show turned out to be the M-drive gearbox which seemed to go for the right gear on every occasion, loaded or empty, even avoiding the ‘hesitation’ that some self-shifting transmissions succumb to on uneven surfaces or when negotiating roundabouts. Climbing into the Trident wasn’t initially that different to the others, well-spaced steps on round fuel tanks leading up to a wide door opening, though in this case the truck in question was a day cab which make things a bit cosy when you throw in a couple of people and their lunch, bags etc. We wandered along the Geelong freeway, and dealt with the usual frustration of not being able to use the right lane, with trucks being banned from passing in that lane on this stretch of road, as cars and campervans milled around like Brown’s cows. Meanwhile, I got comfortable in the driver’s seat. The 13-litre MP8 burbled away through a couple of straight-cut exhaust pipes behind the cab while the 12-speed M-drive, self-shifting transmission climbed through the gears effortlessly with the empty trailers on behind us. As the white lines on the highway flickered past, I began to ponder the big questions in life, such as: why is belly button lint always blue? Are Panama hats really made in Panama? Could Mack fit an Adaptive Cruise Control (ACC) radar inside the bulldog perched on the bonnet out front? But, before the answers to these questions could be found, I turned off the freeway, onto the Hamilton Highway, and then a typically rutted, potholed Victorian country road. 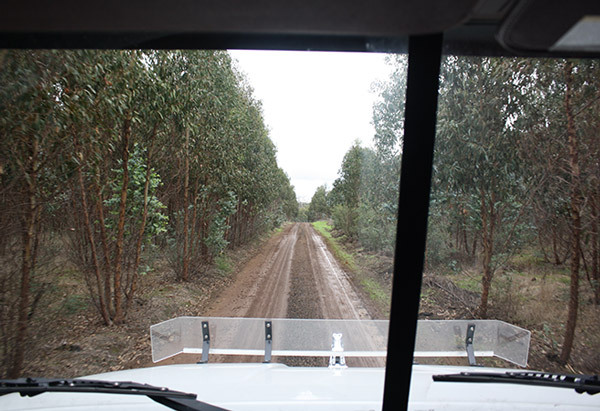 The piggy-backed empty timber skels behind us skipped and bounced as I headed west for Hamilton and my side of the cab soaked up the bumps easily, with the suspended seat ironing out any lumps that the front suspension missed. 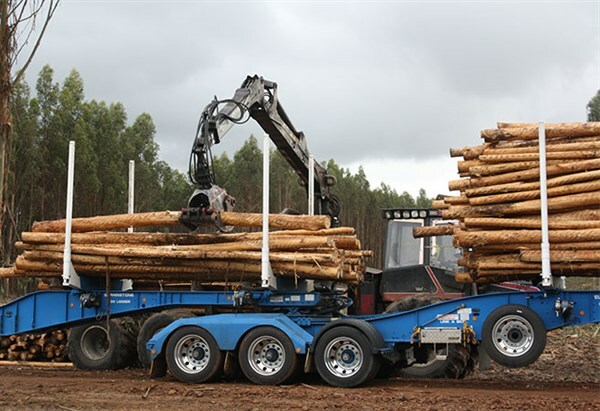 Tony kicked back in the passenger seat, explaining that while he’d only worked for Richard Pelz for around six months, he had a number of years under his belt in the forest both as a truck driver and as a machine operator, felling and loading logs. 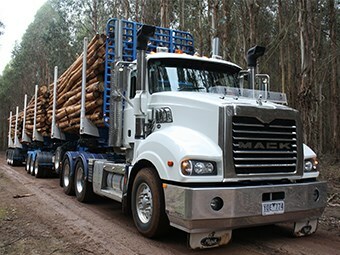 Now 47 years old, he first hit the road at age 19 after a mechanics apprenticeship and on to a career of general freight, fuel tanker work and interstate trucking before coming to timber haulage and bush work. I asked Tony what attracts him to the job, and he replies: "I like being left alone to do my job, no time slots, just hook in and do your job". 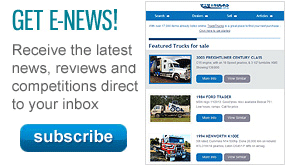 It’s a sentiment that you hear often from long-term drivers, especially those who cover a lot of ground. Just south of Hamilton, I pulled up and let the real professional take the wheel before we head into the bush. Tony explained that it’s been raining and that the track into Timbercorp’s Branton plantation is red clay, wet and treacherous. Only the day before his tag trailer slid off the track and had to be unloaded and pulled free of the quagmire. I gladly left it up to Tony. This is where the drive got really interesting with Tony knocking the M-drive transmission into manual, locking it into gear and letting the empty Mack idle through the bush safely. On reaching the logging coop, Tony turned the rig around and unloaded the tag trailer from on top of the lead trailer. The turntable on the lead trailer unlocks and slides down the chassis of the trailer, using a power take-off (PTO)-driven winch, the turntable is then locked into place when the tag trailer is in position on the ground. Communicating with Tony by radio, the 6x6 Terex log forwarder emerged from the bush with a load of logs and started to pile the cargo on. For a machinery geek like me it doesn’t get much better than this, as the mechanical arm and claw attachment of the Terex expertly stacked the logs into place with astonishing dexterity. At one point when one log threatened to bounce off the trailer the operator expertly snatched it out of the air and put it back into place. The truck axle weights are checked using on board scales, and once satisfied that all is legal, Tony secured the load using pneumatically actuated winches, as well as a belly chain around each stack for good measure. As the Trident is a stand-in vehicle it hasn’t been fitted with central tyre inflation (CTI); most full-time log prime movers are equipped with CTI as it lets the driver deflate the tyres to 40 psi in slippery conditions, giving the prime mover more traction. 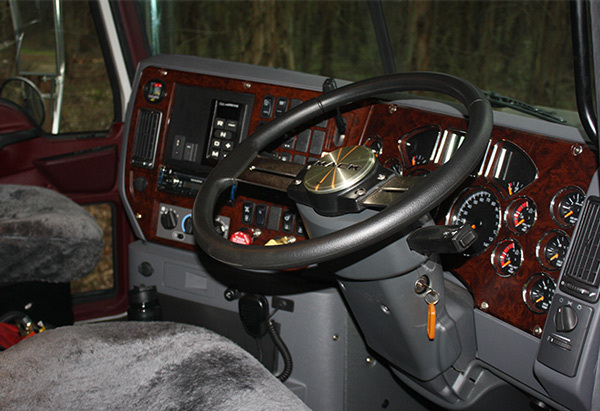 Tony says that while he’s a bit ‘old school’ when it comes to transmissions, preferring a gear stick in the rough stuff, he’s impressed with the driveability and control of the self-shifting Mack box. Bear in mind that, as he’s saying this his hands are constantly moving on the wheel as the drive wheels of the prime mover are pushed from side to side on the slippery clay surface, as they try to follow the camber of the track with 68.5 tonnes of gross weight nudging them along. Back out on the black top, we once again trade seats, with me climbing behind the wheel for the drive back to Melbourne. Now fully loaded to a Mass Management weight of 68.5 tonnes, driving the Trident was a completely different kettle of fish, with the little dog now needing every one of its 535 ponies (399kW) to get the wheels moving, lugging through town with a muted growl. It is here that the 1,920ft-lb (2,603Nm) of torque really made itself known, providing some much needed oomph when dragging the heavy load of sticks through intersections and roundabouts. By using the Performance Mode button on the transmission pad the gearbox changed through every gear when starting up a long pull from low speed, holding the gears longer, in some cases to 1,850rpm, making the MP8 work. The best part of the P button though, is how it interacts with the quaintly named ‘Powerleash’ engine brake. I don’t know about you but ‘Powerleash’ sounds more to me like the name of a World Wrestling Entertainment wrestler than an engine retardation system. But really, with such a heavy, high centre of gravity load on board, travelling on a rather ordinary country road, the engine brake used its 495hp (369kW) of retardation to great effect, especially when encountering those annoying towns that are strategically placed at the bottom of hills. With the P button pressed and the engine brake on, the transmission down changes came on sooner, maximising the braking effect high in the rev range to a peak at 2,100rpm. 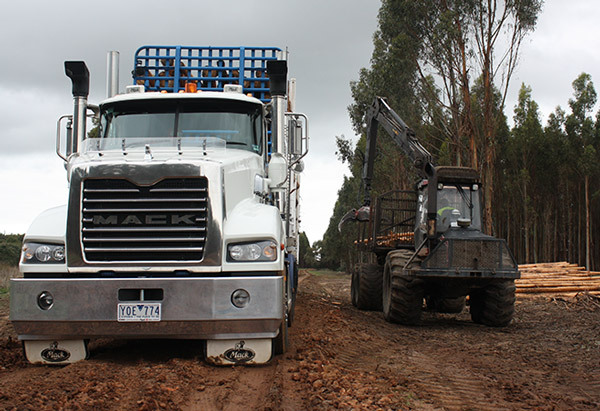 Of course, I also had my hands full on the return trip with the high and heavy load of blue gum ‘shorts’ on board; apparently this is the most unstable load of logs that you can haul, with two stacks of short logs on the tag trailer, rather than one stack of long timber. This means that when cornering at highway speeds the rear stack of logs tends to lean out of the corner, making you think very carefully about where the speedo needle is going to be pointing at the apex of a corner. Truthfully, as a full-time B-double logger, the MP8 is probably a bit light on power-wise, but this is an extreme application that combines punishing road surfaces with higher than usual pay loads. A few of the long pulls we encountered on the way back left the 13-litre gasping for breath, but it still managed to put in a mighty effort. Tony echoes this sentiment in an understated manner, surmising that "it still has a fair crack at it though" and I found myself agreeing. Yes the MP10 Superliner that will be arriving in a matter of weeks will probably be a better fit for the job, but both Tony and I seemed to be in agreement that the MP8 performed at a level outside any preconceived ideas I may have had about a 13-litre engine playing in what is essentially a 15-litre domain. Watts should know; after hopping out of a C15-powered T900 Kenworth to drive the Trident for a while, Tony didn’t seem to have a bad word to say about the Mack. I walked away after a day in the Trident with the distinct feeling that the mid-level Mack would, in Tony’s words "have a crack" at most applications. But, my impression is that the Trident is more than capable as an on- highway B-double hauler, providing a balance of driveability and comfort and, dare I say it, maybe even a bit of character.